Recreational players are generally new to the sport and the games are typically focused on fun and getting maximum touches on the ball. The single most important part of a soccer players technique is the first touch. The professional players who we all look up to -- Messi, Ronaldo, Rooney, Lampard -- they all have a magnificent first touch. But what is this mystical "First Touch"? It is best described as the ability to control the ball quickly and redirect it for our next purpose, whether that be a pass, a dribble or a shot on goal. Now of course we do not expect very young players to be able to produce the perfect "First Touch" but with our training we will endeavor to set them on the right path. Training sessions are designed to be fun. Because if your child is not having fun they will not love the sport. If they don't love it, they won't want to play. The First Touch is just the first step in a long journey, but probably the most important one. 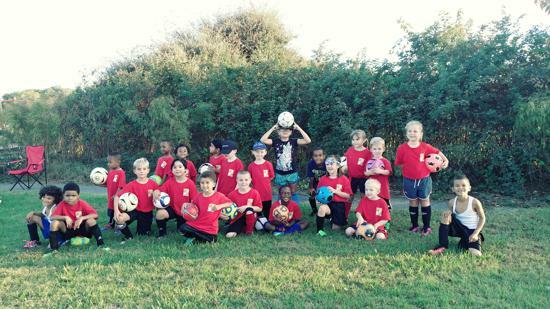 This group will train twice a week with the focus on Fun and the beginning of fundamentals. Each Saturday morning there will be an in-house game against other First Touch players. As important as our First Touch program is for our younger players, it is very necessary for those basic skills to be honed for the future. This program is a continued learning program: "Fun"damentals are a priority but we also start adding technique and tactics. VIP will continue to promote the technical benefits of the game and by making our players more skillful, we will promote more fun. This group will train 2-3 times per week. We will have weekly matches on Saturday mornings on both home and away fields. Futures players are being groomed to move into VIP's Travel Soccer Program in the Virginia Soccer League as they grow older. Therefore, fundamentals and proper technique are constant, with a greater emphasis on game tactics and teamwork. This group will train 2-3 times a week. Futures will play Saturday morning matches as well as the occasional local weekend tournament. Tournaments will be optional for individual players, and will cost approximately $30-50 extra. If you wish to volunteer as a Coach or Team Parent please click here. Important Information for U8 and above players. VIP United is excited to be able to offer a different option for our Developmental/Futures programs. VIP has teamed up with US Club soccer to have a place to play our more advanced players during the year. All Developmental and Futures players will register online at the cost of $85.00. After observation by coaches and VIPs Technical Director and Director of Coaching, offers to players to play in at a higher level of soccer may be made to travel soccer with a cost of $300.00. The difference of $215.00 can be made in payments. Those not chosen will be observed during the season and have a chance to move up. Recommendations to move a player will come from the coaches of that age group, plus there are opportunity's to "guest" play during the season. Three more inducted into the Ring Club. Congratulations to Coach Justin Slezak! Justin Slezak- He's one of our own! Congratulations to Coach Vicki Signorelli for her National Youth License. Where learning and having fun playing the game are equally important!